Get Halcyon Highway in your inbox! My father once said that every generation thinks their time on earth is the best and the longer you stick around the more you become nostalgic for simpler times gone by. Times when you would call a company and a person would be on the other end, or when you could press 0 on your phone and an operator would answer, a time when if you wanted to talk to someone you went and visited them, a time when you would go to a local store and know the shopkeeper by name, a time when you knew everyone in your neighborhood. I think it’s natural for each generation to lament times that have passed. Those times when they were younger, when everything seemed easier, slower, more personal and less expensive. I remember I’d laugh or roll my eyes as a kid when my grandparents would talk about how you could buy this for a nickel and ride the subway for a dime. Wow would they be shell-shocked today! I was at the Angelika Film Center yesterday and I ordered a soy latte. The girl behind the counter said “$6.25 please”. As a New Yorker you get used to being charged outrageous sums of money for things but every once in a while it hits you and you think “Really, are you kidding”? $6.25 for a cup of coffee with some soy milk in it! In all fairness it was a large latte. I find myself having more and more of these experiences of late while wandering through the city with friends we hear ourselves saying things like “Remember when that was that awesome little restaurant and now its another bank” or “Remember that great club, that great store, can you believe that place isn’t there anymore” I suppose as the saying goes “You can’t stop progress” but the question I often find myself asking these days is “Is it really progress, is this better than what was here before” Most times the answer is “no”. I moved to the city in August of 1988, it really does seem like yesterday. I remember my first apartment. I can close my eyes and see myself putting up the off-white roller shades in the living room, putting down the black and white, peel and stick checker-board tiles in the kitchen. I remember how hot it was, since I hadn’t bought the window A/C units yet. I remember my mother coming in to help me clean and the two of us sitting on the floor eating salami and cheese sandwiches that I got from the deli on the corner. I bet that whole meal didn’t cost $6.25. It’s mind-blowing to me that the day I’m remembering happened over 22 years ago! 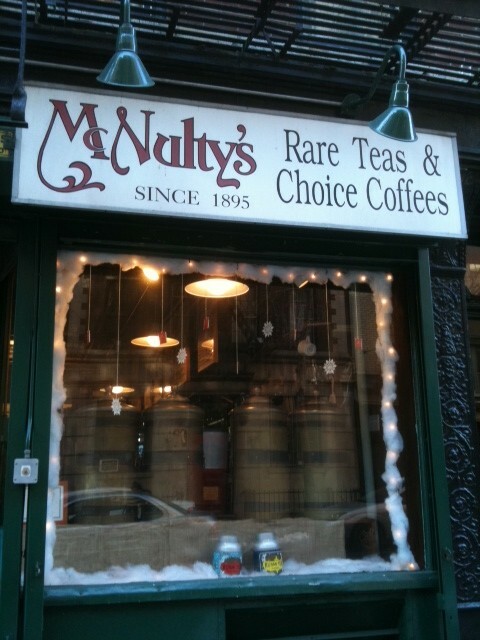 Two of the places that are still around and I frequent as often as possible are Katz’s Delicatessen and McNulty’s Rare Teas and Choice Coffees. One of those places you’ve probably heard of, the other probably not. The beautiful thing is my favorite memories of both of them revolve around my Dad and my Nana. Dad first. He gets this big goofy grin on his face whenever anything excites him, which is pretty much everything, so we see that look a lot. He loves to go to Katz’s and if anyone in the world pays attention to the details around them, it’s him. He enjoys the way Katz’s looks and smells–then again who doesn’t! We don’t usually get waitress service (there’s a section for that and a section where you go up to the counter and get your own sandwich) He likes to get the sandwich himself, because they give you a slice of corned beef while you wait and why would you want to miss out on that he always asks. 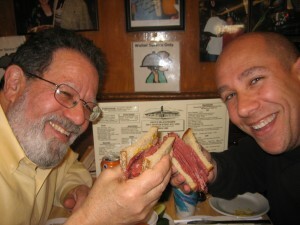 I order a corned beef sandwich too as well as a potato knish and a Dr. Browns Black Cherry Soda. Dad forgoes the knish (stealing a bite or two of mine usually suffices) and is more of a cream soda kind of guy. The talks we’ve had and the sandwiches we’ve shared at a place that has seen father and sons share sandwiches and stories together since 1888 is nothing short of magical I know I get the same goofy grin he gets every time I think of our visits to Katz’s together. . I hope its there for another 100 years for all the fathers and sons yet to come. I’ve been going to McNulty’s since I moved into the city. In the late 80’s early 90’s I discovered flavored coffees. My coffees of choice back then were vanilla, hazelnut and chocolate raspberry all of which I now find completely revolting. My palate has evolved over the years and those coffees have been replaced by the more traditional, high-brow blends– Costa Rica, Jamaican Blue Mountain and Sumatra. Back when I first started going there, I thought I was very fancy and highfalutin buying coffee at a specialty shop in NYC–what a sophisticated city boy I was! McNulty’s looks like it hasn’t changed since it opened in 1895 probably because I don’t think it has. For the past 31 years it’s been owned by a lovely Chinese man and his son. Much to my own dismay, I don’t know either of their names. Sometime around 1990 I would guess, 20 years ago or so, I was in the store on a rainy Sunday afternoon with my Nana. Nana was never called grandma, grandmother, granny or anything like that. If you knew her you’d completely understand why. She loved to eat coffee ice cream, loved the smell of coffee, but hated drinking “the stuff” as she referred to it. “I just don’t like the taste of it dear” She did love going to McNulty’s with me though and realized that it’s a very special place. The entire store, including the two owners erupted into laughter. Nana realized what had happened and of course we got hysterical as well. She looked around and said to everyone and no one in particular ”Well I’m not wrong am I, it’s probably not McNulty” More laughter. She was so adorable and her laughter was so infectious that you couldn’t help joining in. The store owners confirmed for everyone’s benefit that their name was indeed not McNulty, which of course everyone already knew. As assumed it was the name of the original owners. That was a typical outing with Nana, she could turn and ordinary visit to buy coffee into a funny moment for anyone within earshot. 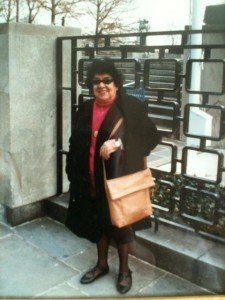 Sadly, Nana hasn’t been around for a long time, but I can assure you her spirit and sense of humor lives on every day in my memories, my father’s memories, in our hearts as well as in our own way of seeing the world. She always referred to New York as “Her city” and in many ways it was. She loved it as much as my father and I do. I often wonder what she would think about people (including myself) who go to the theater in jeans these days. When I went with her, something we often did together, I wouldn’t dare leave the house without a jacket and tie. I wonder what she’d think of all the neon billboards and chain stores. I’m pretty sure she’d say”Well dear it has changed a lot but my city is still the best city in the world and it always will be”. I would have to agree with her. 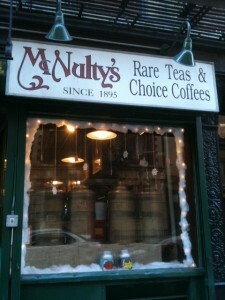 I was in McNulty’s yesterday. I bought a pound of Costa Rican Coffee and a half a pound of Jamaican Blue Mountain Coffee for $31.50. I was happy to pay it and didn’t think “wow that’s so expensive”. I don’t go there to feel fancy of highfalutin anymore, I go there because some things need to live on for as long as possible and change is not always the right answer, sometimes what’s already there is exactly the thing that’s supposed to be there. I told the son, who’s now a man in his early 50’s how I’ve been coming there for over 20 years. He said he was so grateful for all the loyal customers they had. I never shared the story about that day in the store with Nana with him until yesterday. It was just as funny as the day it happened, at least to me anway. I asked if they planned on being there for a good long time and he said he hoped that they would. He mentioned that they’re currently in the process of renegotiating and renewing their lease so who knows what’ll happen. I wonder if one day I’ll walk past that spot to see a nail salon or a trendy boutique and think “Wow I remember when that was McNulty’s, Rare Teas and Choice Coffees I loved that place”. I closed my eyes for a moment before I left and remembered that day in the store with Nana. I saw her smile and heard her laughter. Things do change and some things do indeed go away, but the important ones always stay with us if we let them. © 2019 Halcyon Highway. All Rights Reserved.